This “immensely enjoyable tale of empowerment” (Patrick Henry Bass, NY1) about a gentle Rhode Island woman who makes her first journey to New York City to buy an exquisitely tailored dress “gets to the essence of why style matters” (Kate Betts). Emilia Brown has spent a frugal, useful, and wholly restrained life in Ashville, Rhode Island. She is a genteel woman who has known her share of personal sorrows and quietly carried on, who makes a modest living cleaning and running errands, who delights in evening chats with her much younger neighbor, and who counts her blessings on a daily basis. While helping to inventory the estate of the late grand dame of Ashville and her lifelong source of inspiration, Mrs. Brown comes upon a dress that changes everything. It’s a simple yet exquisitely tailored Oscar de la Renta sheath and jacket—a suit that Mrs. Brown realizes, with startling clarity, will say everything she has ever wished to convey about herself. As a means to an end as much as a thing of beauty, she must have it. And so, like the heroine in one of her favorite books Paul Gallico’s 1958 classic Mrs. ‘Arris Goes to Paris, her odyssey to purchase the dress in New York City begins. For not only is owning the Oscar de la Renta a must, the intimidating trip to purchase it on Madison Avenue is essential as well. If the dress is to give Mrs. Brown a voice, then she must prepare by making the daunting journey—both to the emerald city and within herself. Timeless, poignant, and appealing, My Mrs. Brown is “a contemporary fairy tale…a gentle rebuke to today’s hyped-up fashion culture” (The New York Times). William Norwich is a writer, editor, and video and television reporter. He is the author of the novels My Mrs. Brown and Learning to Drive as well as the children’s book Molly and the Magic Dress. Norwich also has written introductions and essays for many pictorial books. Currently the editor for fashion and interior design at Phaidon Press, he has also written and edited for The New York Times Magazine, Vogue, Town & Country, Architectural Digest, and New York magazine. Norwich is a graduate of the writing program at Columbia University (MFA), Hampshire College (BA), and the Pomfret School. He lives in New York City. "So genteel, so old-world, so self-effacing, so full of surprises--Mrs. Brown's entrance into the world of high fashion will delight you. She'll change the way you look at certain women, and she'll stay in your heart forever. Only Bette Davis could portray her remarkable excursion to New York when she goes on a secret mission that will bring you to tears." "In the gentle hands of Billy Norwich, the tale of the odyssey of a simple woman, an "invisible" woman, to the city becomes a wise and sensitive statement of the dignity and decency of ordinary lives. The moving and wonderfully entertaining Mrs. Brown has great heart and a real soul. Thank you, Billy, for this very human tribute to the women who too often pass unseen, quietly and courageously carrying on." "My Mrs. Brown is a delightfully charming and poignant story that gets to the essence of why style matters, as a deeply personal expression of both who we are and who we want to be." "Much like the classic Oscar de la Renta dress this charming book pays homage to, My Mrs. Brown is lovely, timeless, and a pleasure to behold." 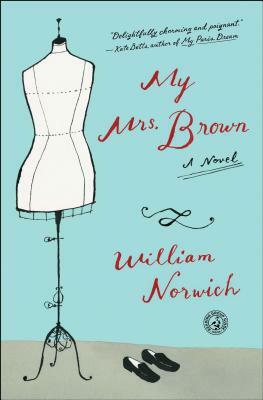 "Norwich crafts Mrs. Brown with the sensitivity of a seasoned sculptor....a flawless and immensely enjoyable tale of empowerment."